Decisions about protected areas can be contentious. It isn’t often that fishermen and environmentalists find ourselves celebrating new protected areas together, but on the West Coast we’re doing just that. This week, I had the pleasure of being present as the Pacific Fishery Management Council voted to support a collaborative effort to reopen thousands of square miles of previously-closed West Coast fishing grounds, much of it in the Rockfish Conservation Area (RCA) while at the same time protecting 140,000 square-miles of highly valuable fish habitat. That’s bigger than the state of New Mexico! The story of how this came to pass is a perfect representation of the kind of collaboration taking place in the West Coast groundfish industry that is making it more sustainable, resilient and profitable for the long term. Implemented in 2002 to minimize catch of overfished species such as darkblotched and canary rockfish, the RCA closed a coastwide ribbon of ocean between depths of 100 and 150 fathoms. Although appropriate for its time, the RCA was a blunt regulatory instrument. While it closed some areas of sensitive, high value habitat like underwater cliffs, rock piles and pinnacles where several species that were considered overfished congregate and reproduce, it also prevented access to vast areas of sandy, soft-bottom seafloor where more plentiful target species like Dover sole and sablefish are found. When catch shares were adopted by the fishery in 2011, the policing effects of the RCA were effectively rendered obsolete, because the new system strongly incentivized fishermen to avoid overfished species of their own volition. In fact, discarding has dropped 80% since then, and darkblotched and canary rockfish, along with 4 other once depleted species in the fishery, have been declared rebuilt. For this reason, fishermen wanted access to the RCA’s sandy, non-sensitive fishing grounds. Although the Council was open to the idea, they also wanted to examine any habitat impacts of reopening the area, so they wrapped that examination into a scheduled 5-year review of the West Coast’s Essential Fish Habitat (EFH). At that point most commercial fishing and environmental stakeholders began lining up in their accustomed positions with environmentalists ready to advocate for increased area closures and fishermen digging in to avoid further loss of fishing grounds. 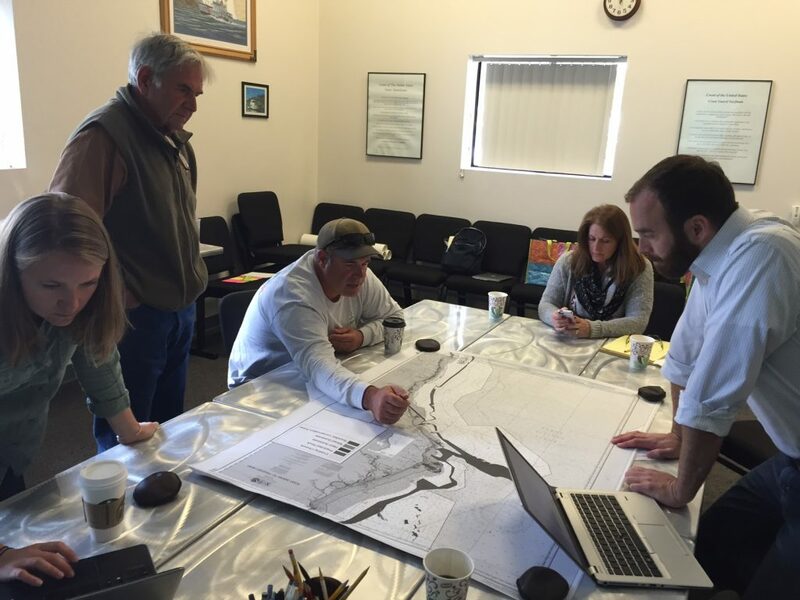 Seeing an opportunity to break a zero-sum faceoff, I joined with Seth Atkinson of the Natural Resources Defense Council, Tom Libby, an Oregon seafood processor representative, Brad Pettinger of the Oregon Trawl Commission, and Kate Kauer of The Nature Conservancy to collaborate in a new way. 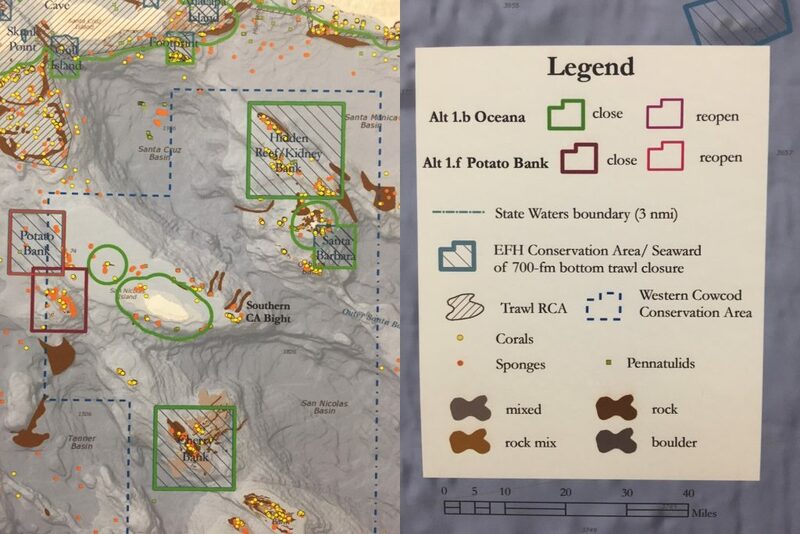 Previous EFH studies had identified well-known locations of key habitat, but in recent years, a great deal more data about the seafloor has been generated. If we could pinpoint the sensitive habitat with a high degree of accuracy, the Council could protect those areas and open areas safe for fishing. Over the next two years we convened more than 30 meetings with fishermen up and down the coast. We brought information from new bathymetric surveys, studies using remote-operated underwater vehicles, fisheries observer data and predictive models that identify likely habitat for corals and sponges. Fishermen brought their logbooks, charts and the knowledge gained over decades of combined fishing experience. Together, we were able to identify sensitive areas of the seafloor that should be protected while also identifying soft sandy or muddy areas that are less sensitive and could be opened up for fishing. This transformed the habitat issue from a zero-sum game, where any gain for conservationists meant lost opportunity for fishermen, into a situation where both sides could gain substantial benefit. Establish new protection for an un-fished, deep-water area off California that is the size of New Mexico (roughly 135,000 square miles). This decision was a real show of leadership by the Pacific Fishery Management Council members and State agencies who supported this effort. This would never have been possible without the historic collaboration that led to the adoption of the catch share program in 2011, and the last two years of collaborative input on the EFH/RCA. For me, this project truly reflects the spirit of EDF’s motto, “Finding the ways that work,” and I want to express my sincere appreciation to everyone who helped make this happen. This entry was posted in Domestic, Pacific, Policy, Science/Research, Seafood and tagged Catch Shares, Fisheries Management, Fishermen, Groundfish. Bookmark the permalink. Both comments and trackbacks are currently closed.